The Nintendo Switch presentation to get people even more excited for the system has come and gone, and I wrapped it up for everyone to check out over here. By the look of it, it’s going to be a good time to be a fan of Nintendo. Of course, now that we know what the Switch will have to offer, it’s time to talk about what all we should get excited for. Here’s what I’m thinking. Let’s start with the controllers, or the Joy-Cons. The rumble feature was a big deal for the Nintendo 64 and this feature still holds true today. The motion controls play similarly to the Wii-mote controller and since it’s smaller, it’s easier to maneuver with it. I’m excited to see how they feel when used in-game and inspecting their detachable functionality as well. I have been a Super Mario fan for years now and it’s always nice to see Mario adapt to new controls on each new console. It will be interesting to see how Mario changes when it comes to Super Mario Odyssey. You’ll have to traverse through the different worlds quickly to keep Bowser from marrying Princess Toadstool and what’s the deal with those eyes on his hat? Keeping with the Mario theme is the “new” Mario Kart 8 Deluxe. I put new in quotes because the game has new features added to it, such as new characters and tracks. Nintendo is the master at getting people to purchase the same/similar games over and over again. You can add Mario Kart 8 to that mix. Battle mode was shown off during the Nintendo Treehouse Live presentation and to see classic battle maps return to the game is getting me excited. Bringing back the ability to carry two items during a race a la Double Dash is cool as well. It will be interesting to see if other DLC is added after launch but it would be pretty cool to have other suits for racers to transform into. I would love to drive a Frog Suit Mario around classic courses but that’s just me. 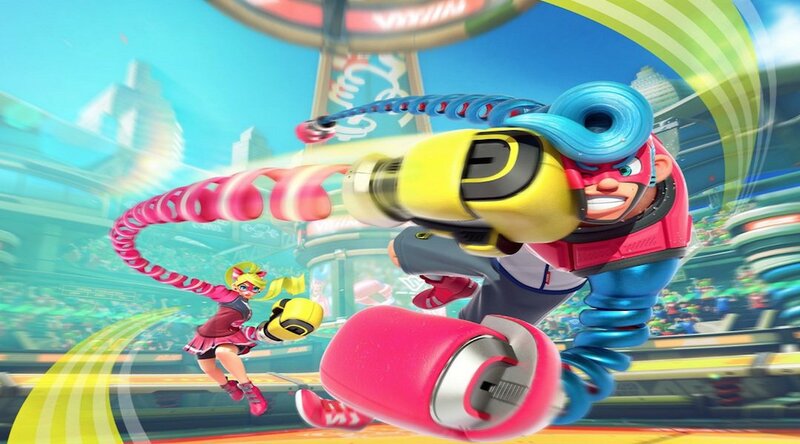 Arms is an interesting game that really reminds me of Wii Sports Boxing. The only difference I can see is that you control fighters with spring-loaded arms to attack. Games like this need the controls to be tight so they respond to your every movement. The controller being a split second off could cost you a match. There was mention of online matches and as long as there isn’t an online lag, should be really fun. The male character in the demo trailer was named Spring Man, isn’t that a Mega Man Robot Master? The Switch will have the game that teaches you the basics of the system but it doesn’t come packed in with it. 1-2-Switch looks simple enough that the whole family can play and have fun together. During the trailer, they showed two cowpokes having a quick draw battle. Turns out you won’t have to look at the screen for some of the games in 1-2-Switch, you’ll have to react to the opponent and their reaction. The Joy Con controllers are all you need to have a great time and who knows, you might find something out about your friends like who can milk a cow! The Legend of Zelda: Breath of the Wild will be the jewel of the Switch launch library. One of the new features shown off in the trailer was voice actors, uncommon for the Zelda franchise. It will be interesting to see how the fan base takes to the likes of Princess Zelda talking. However, it should bring more to the story. I was able to play the Wii U version of the game at E3 last year and was very impressed by the open world traveling and being able to defeat enemies and make my way further anyway I saw fit. This might sound like the company line but you should be excited for Super Mario and the Legend of Zelda. There is plenty more for the Nintendo fan to get excited about such as Skyrim, FIFA, Dragon Quest, and BomberMan. It’s going to be a great time for Nintendo, so start saving those coins and rupees, you’re going to need everything you can get to buy all these games. What are you looking forward to the most? Let us know in the comments below! Make sure you've got your system preordered as well.